Thanks for joining up on the Gimme Some Slack! 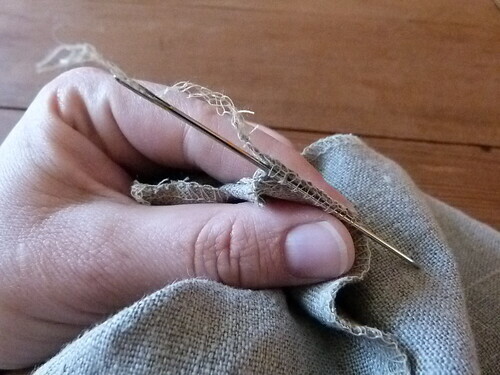 Sew-a-long. We are on the final stretch! This is the second-to-last post. 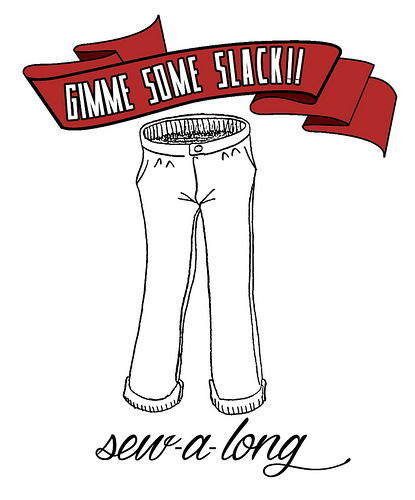 The final post will be one with the slacks modeled on a child. If I can find a child! I am looking for one. 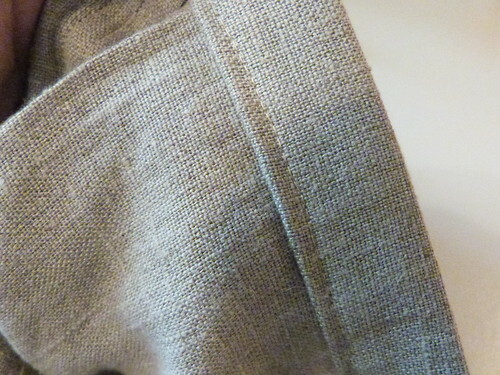 Today is going to be all about steam pressing and wonderful, slim cuff and waistband finishes. 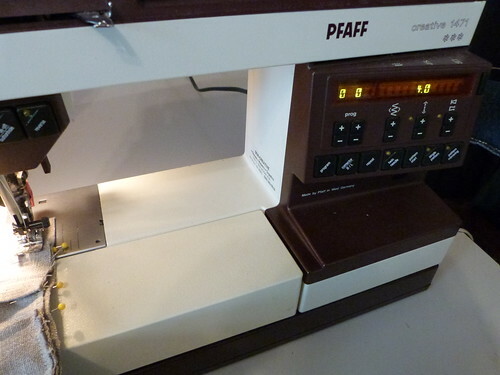 This is an image-heavy post – 53 images – not because the techniques are difficult, but because I want to show you in detail the exacting work required to get beautiful, wearable, and very comfortable results. 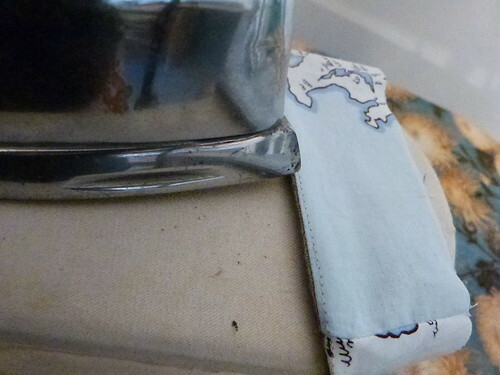 Our progress so far: last month I posted the supply list and timeline, and earlier this month I posted our preparations, including creating our pattern. 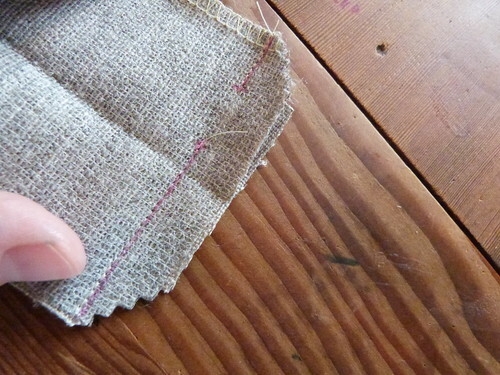 On the sixth I posted our methods for marking, cutting, and interfacing our fabric pieces. 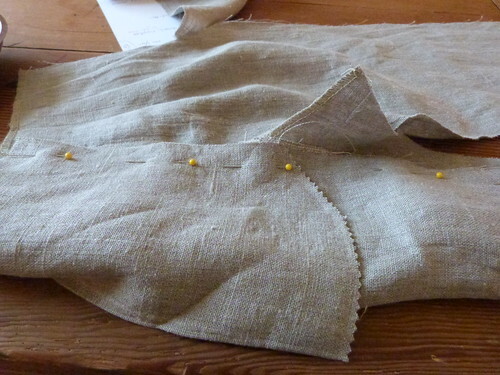 For post four we constructed the darts, front and back, and the pockets, front and back. 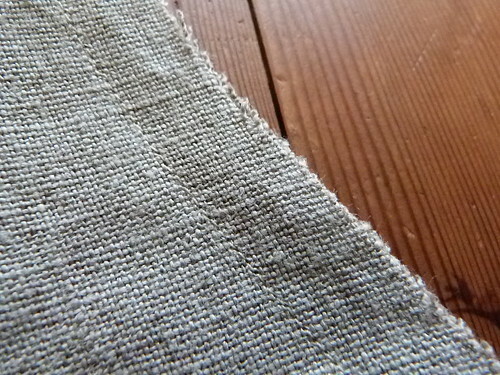 And in post five, we constructed a totally killer, low-bulk, and beautifully-finished fly front. 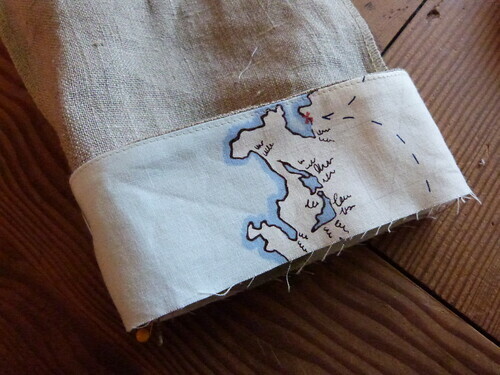 Thank you to all who’ve participated, and emailed or commented suggestions and corrections to this sew-a-long. 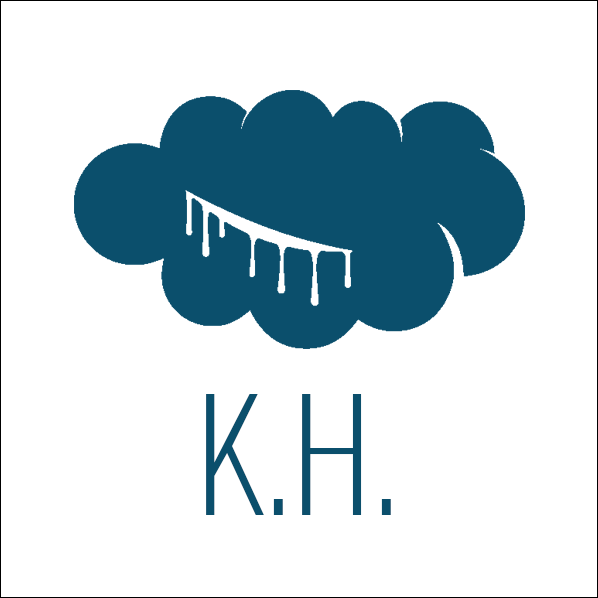 And remember – I am available to support via email, blog comment, and Skype! 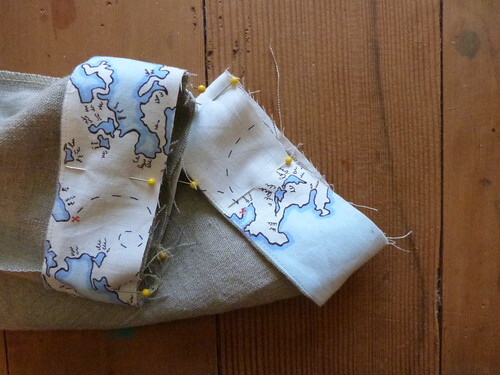 I will Skype support any stitcher through the months of June and July 2014. 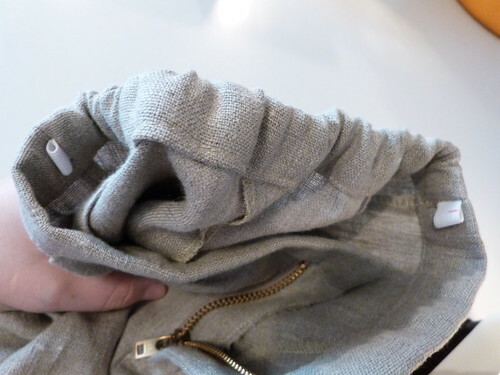 Pretty soon we’re going to have something that looks like pants! 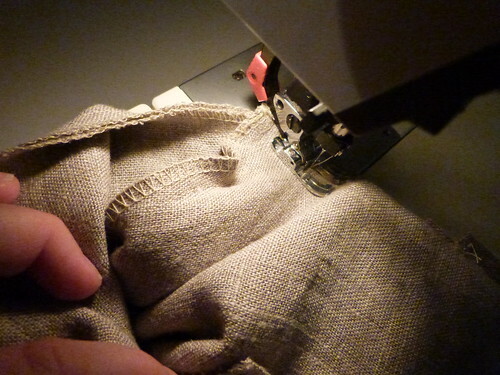 First, we will be pinning the outseam, sewing, and serging; repeat with the inseams. 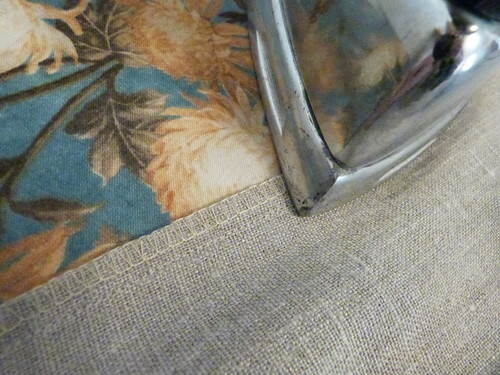 The crotch seams will be last. 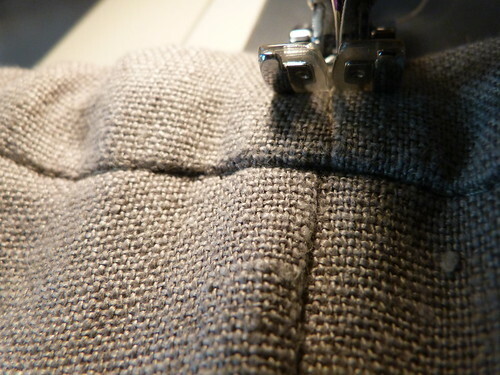 Serge these seams, and if you like, where the inseam meets the crotch, thread the tail through the column of looper stitches. 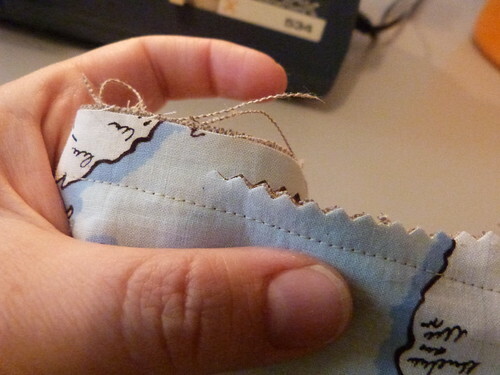 Next, press the seam well. 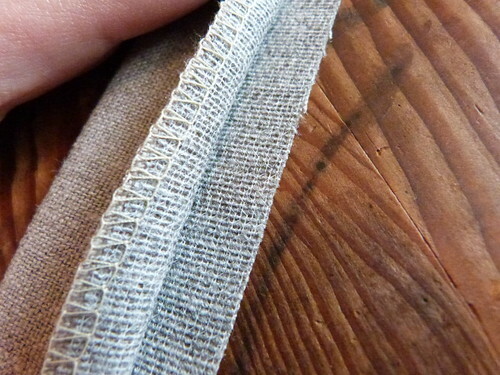 Slip the right side-out leg inside the inside-out leg. 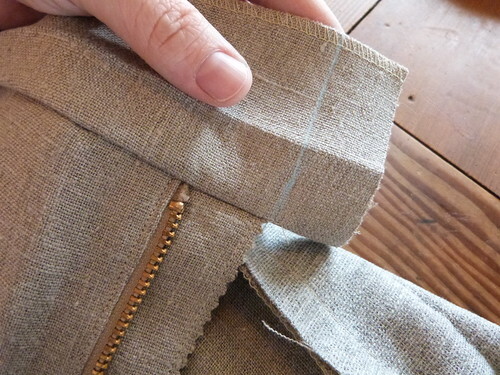 The crotch seams should line up beautifully (believe it or not, it is very possible to sew pant-legs up incorrectly – sewing the legs up separately and inserting one into the other is foolproof)! 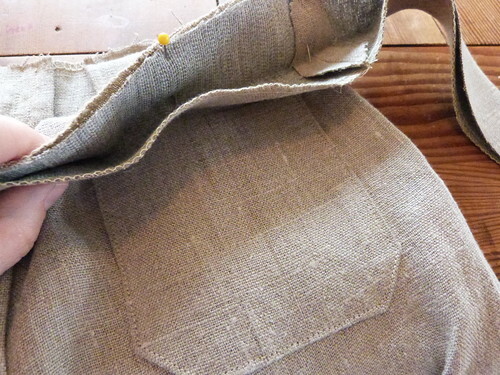 Next, sew that crotch seam all along the back center seam to the point at the center front we’d left off while making the fly. 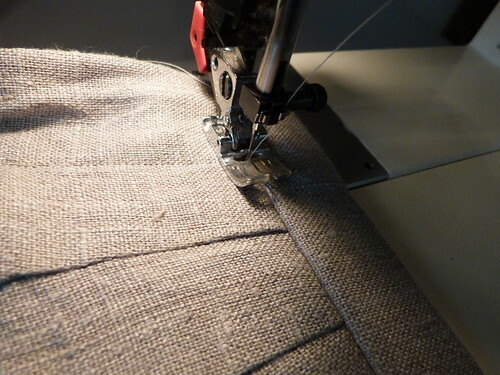 My crotch curves were already serge-finished (if you remember) – but if they aren’t you can finish them later. 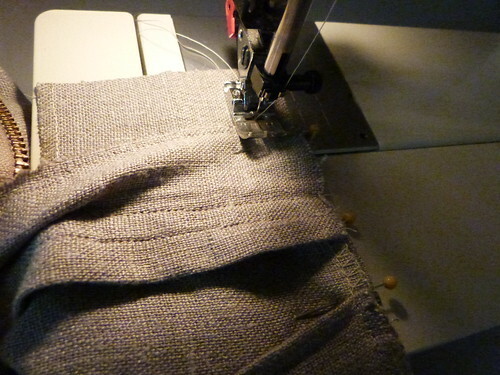 It isn’t a bad idea to have a second line of reinforcing stitches through this curve, either. 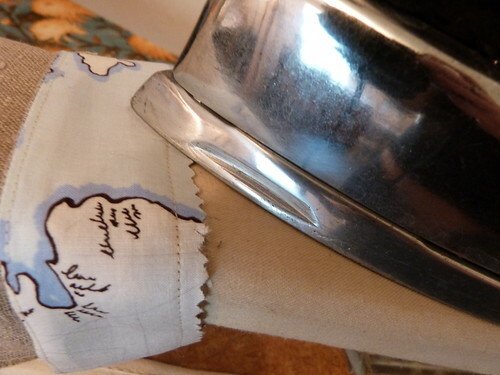 Time for the cuffs! 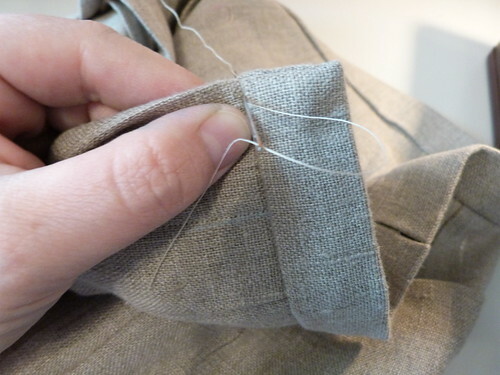 Sew the short ends of the cuff strips together. 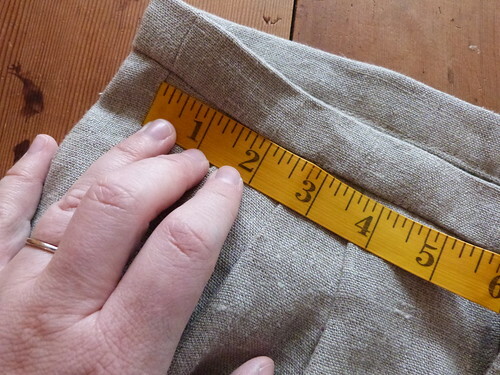 You may want to carefully measure the circumference of your hem at the raw edge, and make sure your finished cuff length matches perfectly. It is worth taking a little extra effort to do this. 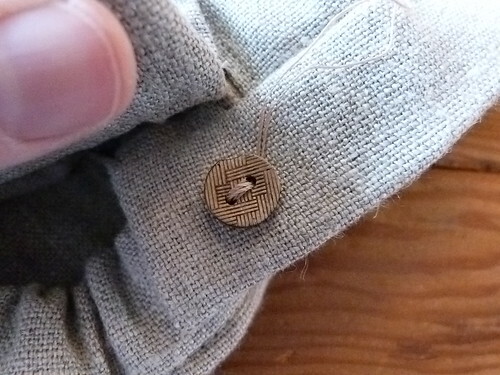 After the short edges of the cuff has been joined, press the cuffs with a lot of steam. 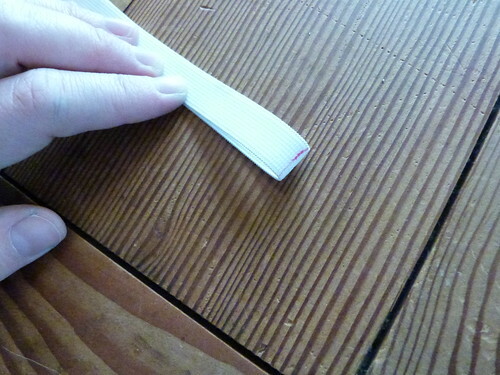 Look, there’s a lot of pressing involved in this installment. Ain’t gonna lie. It’s how things end up looking so great! 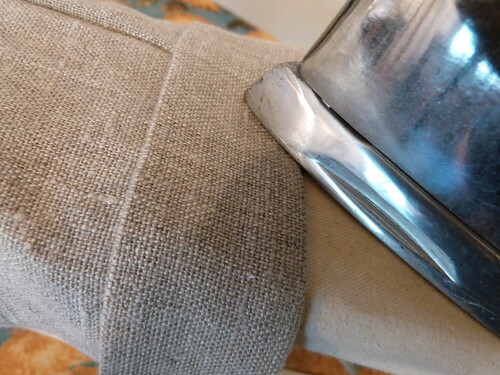 Sew this cuff seam, then trim and grade it. I pinked it because I am a pinking fan. 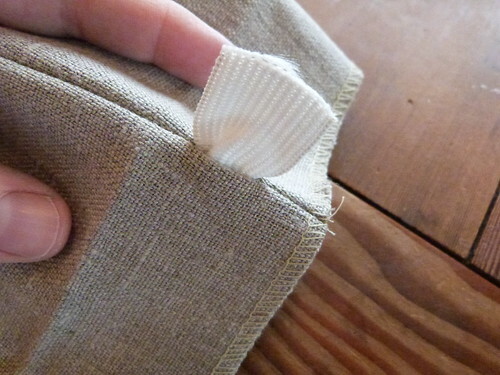 Then flip the cuff to the outside of the pants and give another good press. 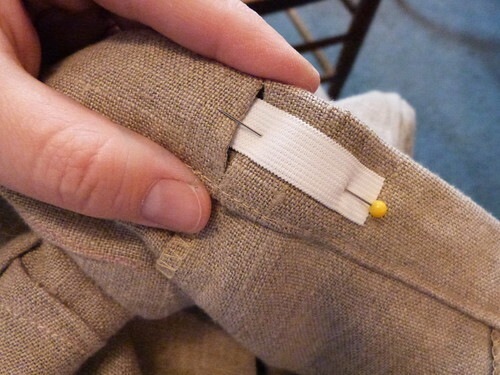 You can handstitch along the inside of the cuff to the side seam if you like. 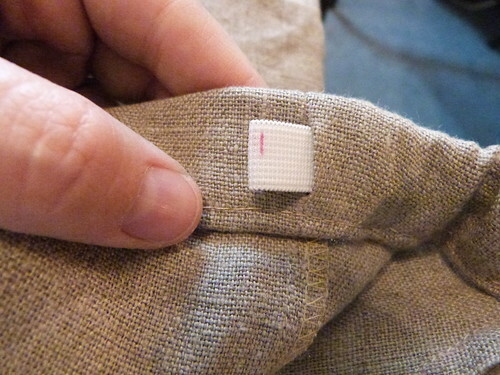 But if you’ve measured and pressed well your cuffs will stay put. Now aren’t these looking great? 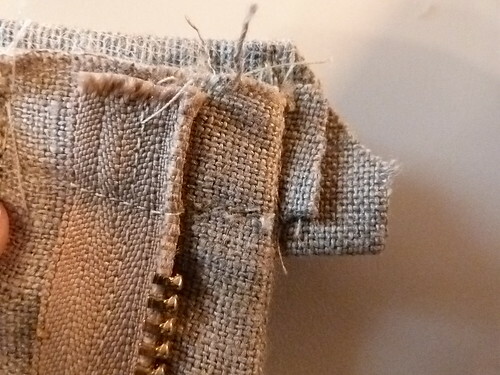 Now, why did we use a basting stitch for the beginning and termination of this first waistband seam? 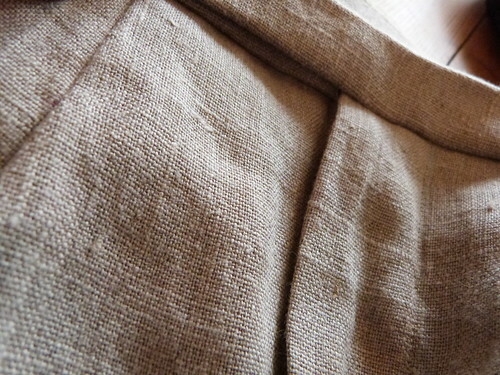 Simply because when you fold up your waistband, the very front of the pant often does not line up. 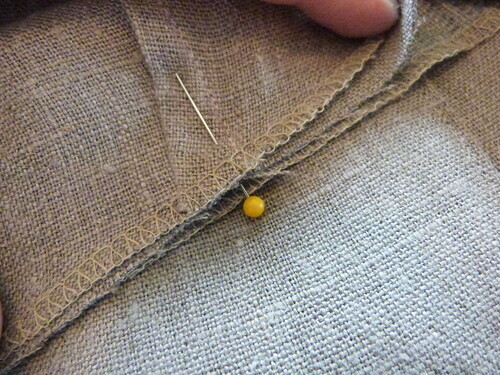 This is one of those irritating things about making trousers and happens, often, no matter how exact of a stitcher one is. In this case, I did happen to get things lined up perfectly the first time. 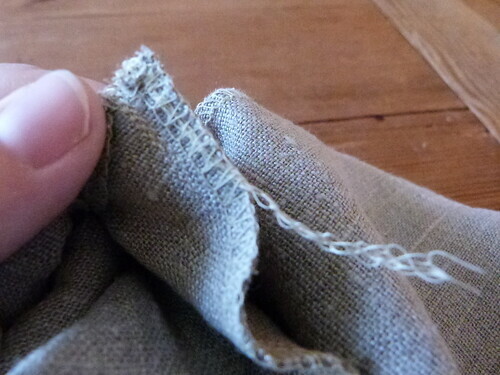 So then, I went back and stitched right over the basting, with a smaller stitch. 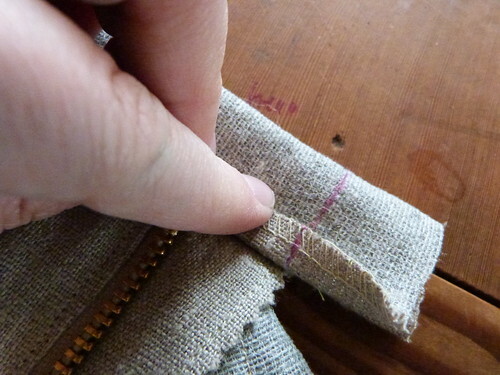 But if your waistband fronts do not line up properly, simply carefully remove some basting and re-stitch. 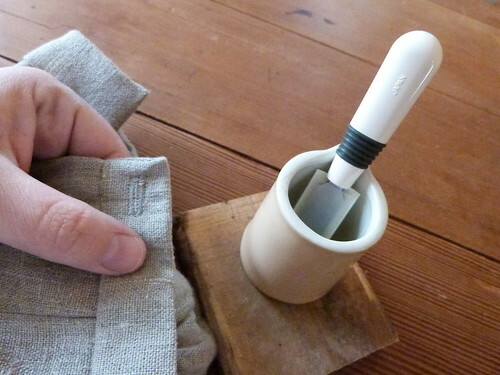 It’s a great little trick! Press everything, again. 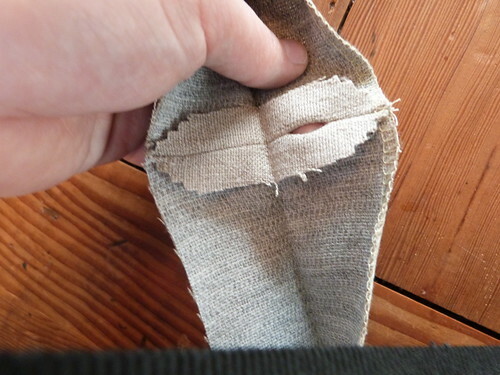 Repeat this terminal process with the other side of the waistband. 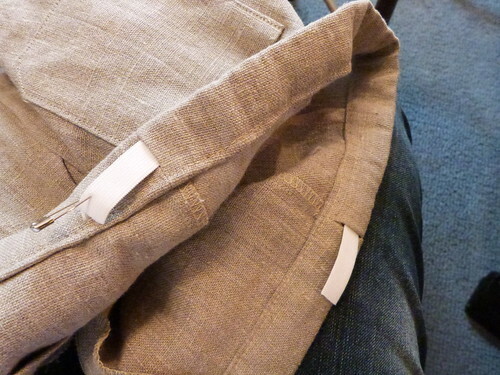 Will catch the fold on the inside of the pants! 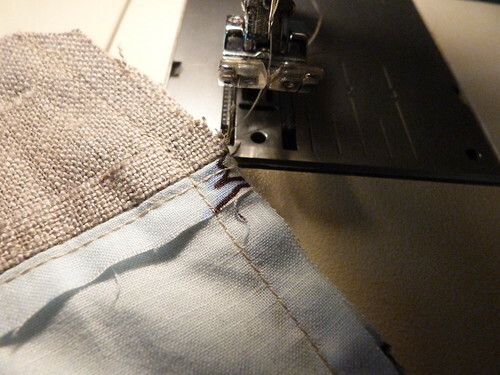 Repeat on the other side – you know have a finished back elasticized, adjustable waistband! Very cute. 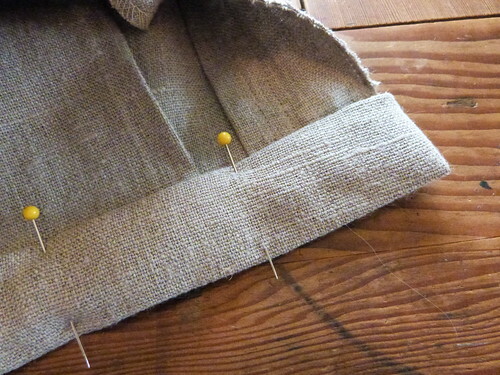 After the buttonhole is stitched, any paper or stabilizer removed, I like to put a tiny bit of thread-glue on the back side of the buttonhole, and let it dry before cutting it open. 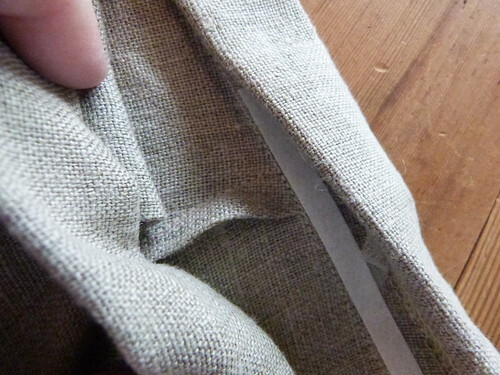 As always, with fabric glue, be cautious: glue can easily seep through to the public side of the garment. 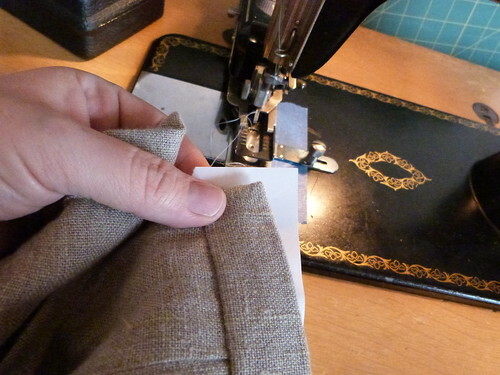 Once dry, I cut my buttonhole open with a buttonhole chisel. 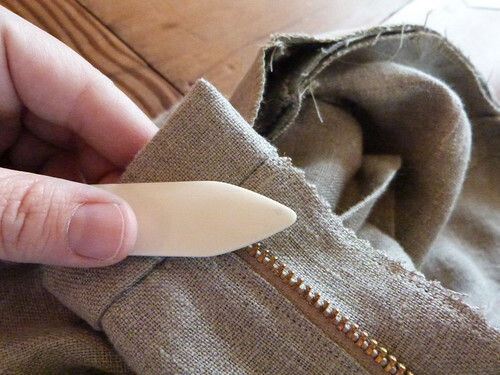 I have used a seam ripper and even – gasp! – scissors. 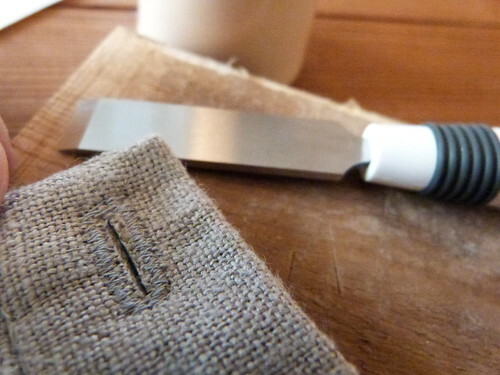 But a buttonhole chisel is very inexpensive and oddly satisfying! Finally: we need a well-secured button. 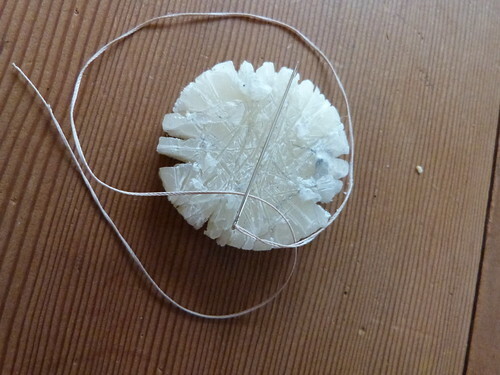 I thread a needle with four strands of thread and wax it by running it through beeswax, and steam-pressing it. 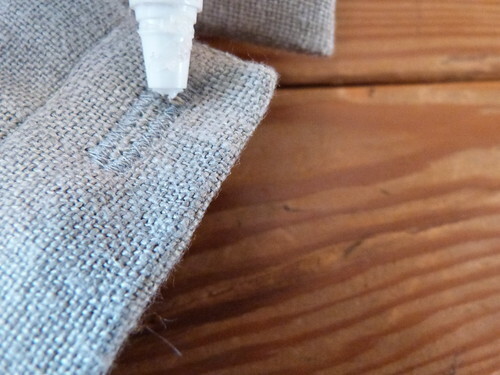 Very strong thread! 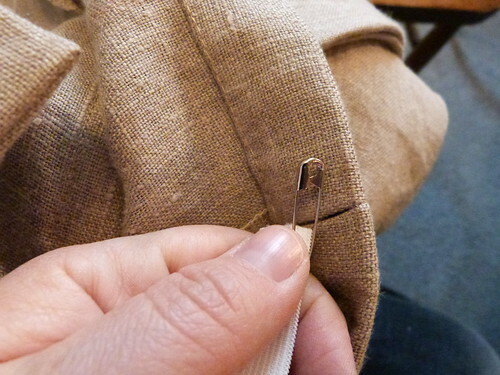 I stitch the button on using an invisible knot to start. 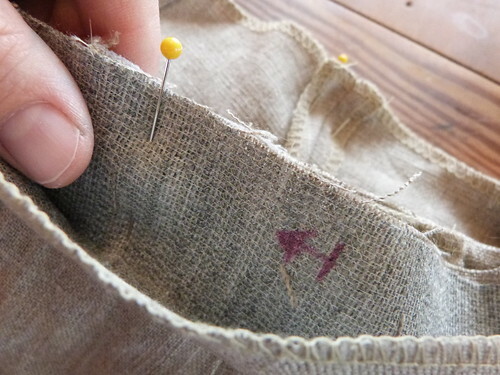 Two passes through the button holes, three-twists around the thread under the button, back through to the backside, and another invisible knot! Oh my gosh! 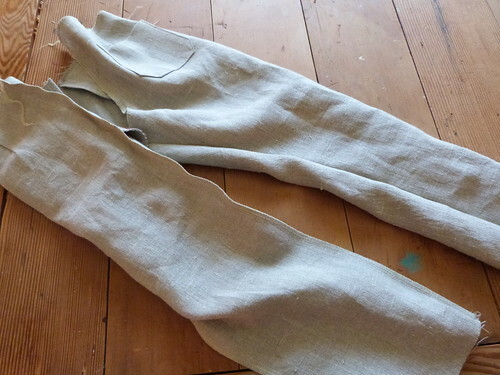 We have made a pair of slacks! Congratulations! 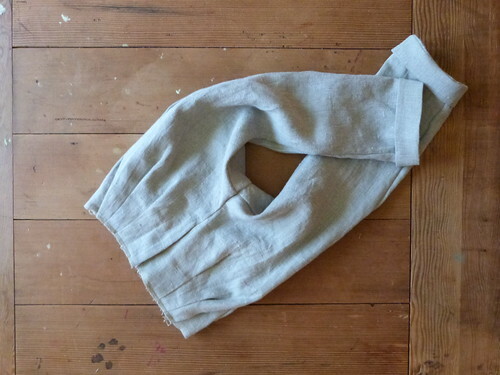 Now – I just need to find a child to model the finished garment, and that will be the last installment of this sew-a-long. 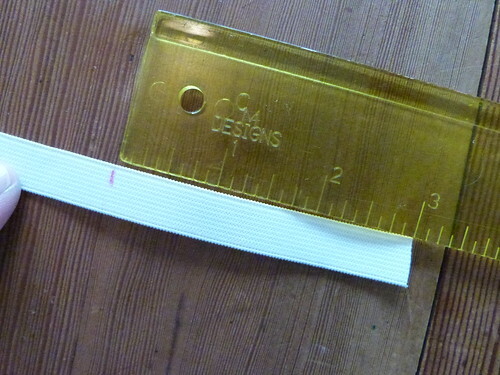 Thank you all who joined, and all who find this sew-a-long at a future date. Please don’t hesitate to let me know if there are any typos, errata, or confusing bits!